Imagine strolling along an ancient Roman street, with vivid painted skies overhead, statues that come alive and the world’s finest designer brands at your fingertips. 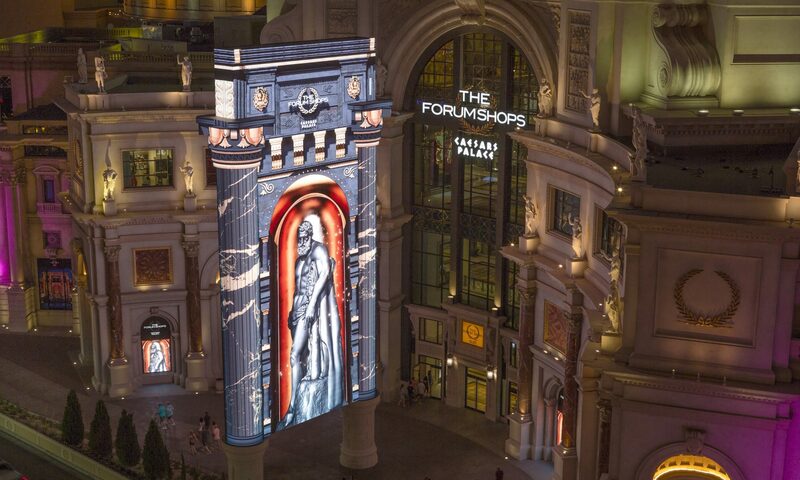 At The Forum Shops at Caesars Palace®, it isn’t a fantasy. Adjacent to the magnificent Caesars Palace at the heart of the Las Vegas Strip, this one-of-a-kind centre rivals the world’s great shopping districts, from the Via Condotti to Rue du Faubourg St. Honore. Do you have the appetite of a Roman gladiator? The Forum Shops at Caesars Palace® serves up the biggest names in global cuisine. Between the shopping, treat yourself to a sophisticated meal at Spago, The Palm, Sushi Roku, Il Mulino New York, Carmine’s Italian Restaurant or Joe’s Seafood, Prime Steak & Stone Crabs. For casual bites, head to Border Grille, The Cheesecake Factory or Planet Hollywood. Just beyond the centre, the star-studded culinary scene of Las Vegas and the many fine eateries of Caesars Palace offer magnificent meals fit for Caesar himself. A shopping centre and awe-inspiring family attraction in one, The Forum Shops at Caesars Palace® will keep you entertained from sunrise to sunset – both of which are depicted on the magnificent, ever-changing ceiling frescos. Just like Rome, the Forum Shops at Caesars Palace® is famous for its fountains. The Fountain of the Gods is the centrepiece of the Fall of Atlantis Show, a famed animatronic attraction complete with fire, dragons and moving, talking statues. Marvel at the 50,000-gallon Atlantis Aquarium, brimming with more than 300 tropical species. Feeling lucky? Try your hand at the opulent Caesars Palace casino, a legendary fixture of the Las Vegas Strip. 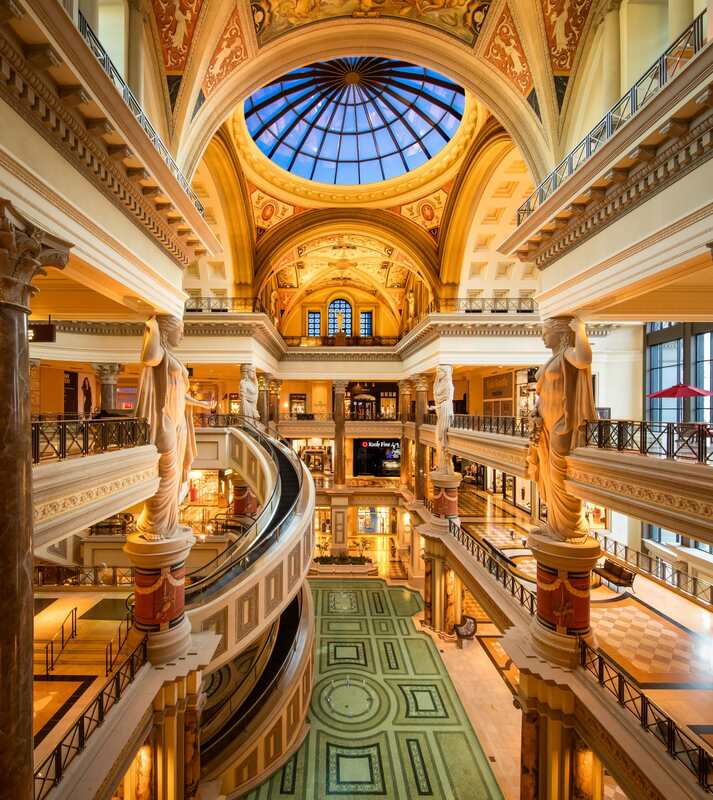 With the lavish accommodations of Caesars Palace Resort just steps away, this is the perfect place to shop till you drop. One of the most legendary destinations on the Las Vegas Strip, Caesars Palace boasts nearly 4,000 rooms, eight swimming pools, one of the largest casinos in Las Vegas and presents the world’s top performers. Other nearby properties include Bally’s, the Bellagio Hotel & Casino, The Mirage, The LINQ Hotel & Casino and Harrah’s Las Vegas. If your Las Vegas holiday will be centered around The Strip, The Forum Shops at Caesars Palace® is never too far away. For shoppers arriving by car, the centre offers plenty of covered parking, as well as a convenient valet service. The Forum Shops at Caesars® is located on the corner of Las Vegas Boulevard and Flamingo Road, adjacent to Caesars Palace. Take Interstate 15 (I-15) to the Flamingo exit, then turn left onto Las Vegas Boulevard. The Forum Shops at Caesars Palace® is located along the main Las Vegas Monorail route, which will bring you to the centre from most major hotels along The Strip. Exit at the Flamingo/Caesars Palace stop and cross Las Vegas Boulevard. The Forum Shops at Caesars Palace® accepts most major credit and debit cards, but there are three convenient cash point machines if you prefer paying that way. They’re located at the Main Valet entrance, on level two near Banana Republic and on level two near Casa Fuente.